Rudolf Schriever and his flying saucer project. Schriever was an engineer and test pilot. We couldn’t find much about Otto Habermohl but he was certainly an engineer. Another player in the saga is engineer Joseph Andreas Epp. 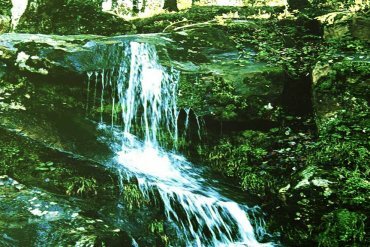 He served as a consultant to both the Schriever-Habermohl and the Miethe-Belluzzo projects. The project’s test facility and development center was located near Prag. Actual construction work began somewhere between 1941 and 1943. And it was originally a Luftwaffe project which received technical assistance from the Skoda Works at Prag and at a Skoda division at Letov and maybe elsewhere. The engineer Andreas Epp who wrote die Realität der Flugscheiben, states that other firms participated in the project too. For instance the Wilhelm Gustloff firm at Weimar, the Junkers firm at Bemburg and Oscheben, and the Kieler Leichtbau at Neubrandenburg. 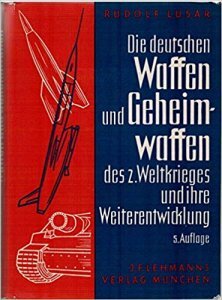 Because this project started as a project of the Luftwaffe it then fell under the control of Speer‘s Armament Ministry. At that time engineer Georg Klein administered the entire project. Finally, probably sometime in 1944, this project came under the control of the SS, specifically under the supervision of General Hans Kammler. According to his own words, Georg Klein saw this device fly on February 14, 1945. This may have been the first official flight. But this device already flew before. According to at least one witness, a saucer flight occurred as early as August or September of 1943 at this facility. It was ‘aluminum’ in color and rested on four thin, long legs. The flight distance observed was about 300 meters at low level of one meter in altitude. According to Mr Epp, they built fifteen prototypes. 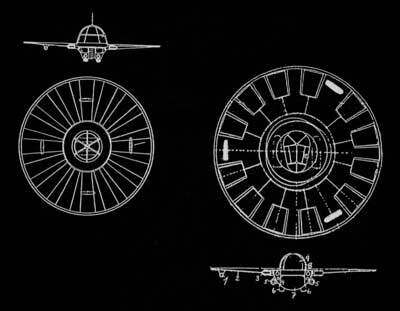 Rudolf Lusar, who worked in the German Patent Office, described the final device associated with Schriever-Habermohl project, as a central cockpit surrounded by rotating adjustable wing-vanes forming a circle. The vanes were held together by a band at the outer edge of the wheel-like device. The pitch of the vanes could be adjusted so that during take off more lift was generated by increasing their angle from a more horizontal setting. In level flight the angle would be adjusted to a smaller angle. This is very similar to the way helicopter rotors operate. Small rockets, placed around the rim like a pinwheel set the wing vanes in rotation. 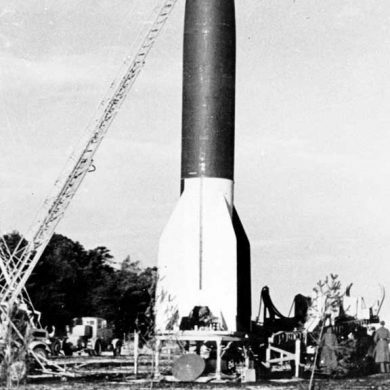 Once rotational speed was sufficient, the device could lift-off. After the craft rose to some height they ignited the horizontal jets or rockets and turned the small rockets off. 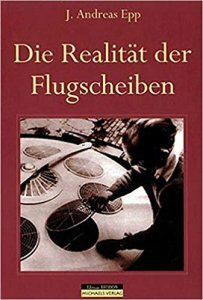 Epp reports in his book die Realität der Flugscheiben (The Reality of the Flying Discs) that an official test flight occurred in February of 1945. Epp managed to take two still pictures of the saucer in flight which appear in his book. 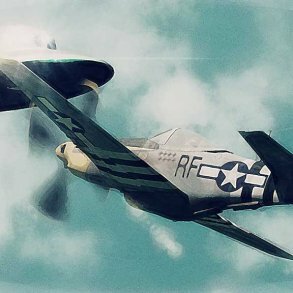 He goes on to say that on the next night, a manned flight broke through the sound barrier. 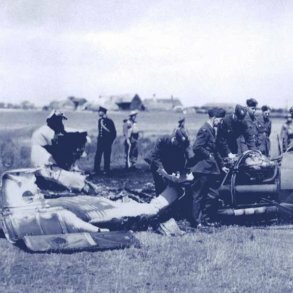 But eventually the vibrations encountered at that time frightened the pilot. On the official test flight, Epp reports a top speed of 2200 kilometers per hour. Lusar reports a top speed of 2000 kilometers per hour. Here Schriever set up an inventor-workshop. 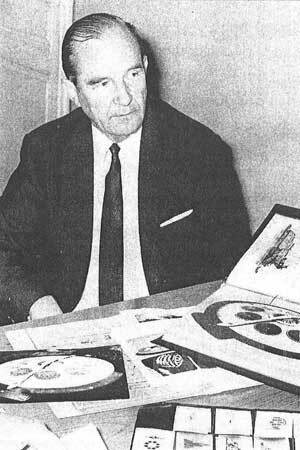 On August 4, 1948 there was a break in to the workshop in which Schriever’s plans and saucer model were stolen. 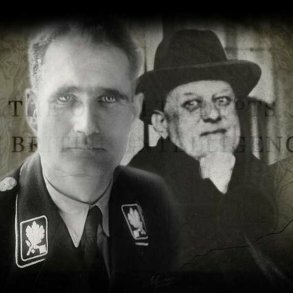 Schriever was approached by agents of “foreign powers” concerning his knowledge of German saucers. He declined their offers, preferring rather boring work driving a truck for the U.S. Army. Schriever is reported to have died shortly thereafter in 1953. Epp’s statement is that it was his design and model which formed the basis for this project. First General Erst Udet received it and afterwards it was forwarded to Dr. Kalter Dornberger at Peenemuende. Dr. Dornberger tested and recommended the design which Dr Dornberger confirmed after the war. Then a facility was set up in Prag for further development. And the Schriever-Habermohl team got the assignment to work on it. 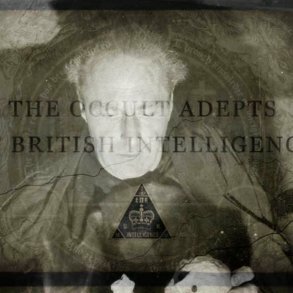 At first this project was under the auspices of Hermann Goering and the Luftwaffe. Sometime later the Speer Ministry took over the running of this project with chief engineer Georg Klein in charge. 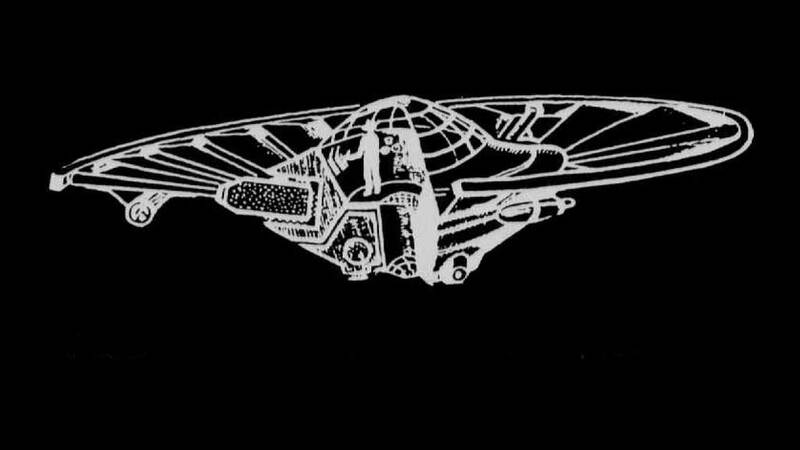 And finally, the SS usurped the project in 1944, along with other saucer projects, and it fell under the attention of Dr. Hans Kammler.